Vendace is a schooling fish of the open lakes and it is the main catch of professional fishermen in Central Finland. The best way to catch vendace for a leisure fisherman is to use nets. The best vendace net fishing season is in autumn during the spawning time. Spawning places are the best net fishing places in autumn. Vendace are fished with nets from the middle of the surface and bottom in summer. The best vendace net fishing season is in autumn during spawning. Summer is also a good net fishing time if the vendace population is strong. You should use nets of little mesh size for vendace.The mesh size depends on the size of vendace. 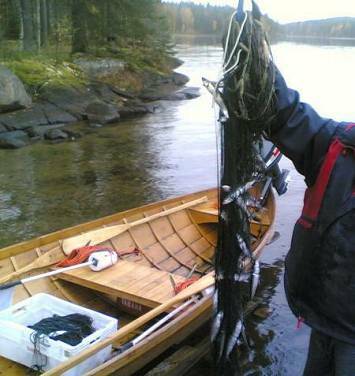 Read more about Net fishing Vendace In Finland. You must always pay National fisheries management fee 2019 if you are aged 18-64 years and get permission of the owner of the water areas is always required independent of the age of the fisher. You can ask Net Fishing licences for example from your cottage owner or local gasstations or shops. Migrations Spawn migration in autumn. Use as food Light-coloured and low in fat.